Soft & Dri Breast Cancer Awareness Prize Pack Giveaway! Fine Print: I was given a prize pack for review and Soft & Dri is giving one to a reader. All opinions and statements below are my own. Soft & Dri, a long-time supporter of promoting Breast Cancer Awareness, has once again partnered with Play for P.I.N.K, a non-profit organization that uses lifestyle and sporting events to raise funds for breast cancer research, in hopes of creating a world where women can feel confident knowing they can live their lives without the specter of a disease that has impacted the lives of far too many. From now through December 31, 2014, sales of specially marked Soft & Dri products sold in North America will support Soft & Dri’s $10,000 donation to Play for P.I.N.K! Soft & Dri offers Aluminum Free, Dri Gel Antiperspirant and Aerosol Antiperspirant Deodorant in specially marked packaging, so keep an eye out at your local store and do a good deed while buying the products already on your shopping list! 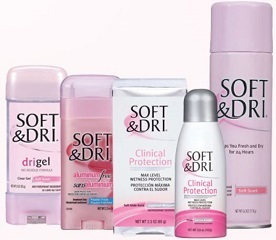 And if you’ve never tried Soft & Dri, not only do they work well, but they smell awesome! I speak from experience here! To get everyone invested in this special promotion, I am giving one lucky winner a Soft & Dri Breast Cancer Awareness Prize Pack! To enter this giveaway, complete any or all of the options listed below. Giveaway ends 11/7. Good luck! I usually use Secret deodorant. My favorite is Secret Clinical. I use whatever I can afford and prefer free. I like mitchum, so does my daughter. I use either secret or degree deodorant usually. My most recent choice is Lady Speed Stick.